Full Body Muscle hi-protein meal replacement shake is the convenient lowcarb nutrition solution for athletes who want to accelerate fat burning while supporting lean muscle tissue. If you have little time to prepare meals, Full Body Muscle is for you. Youget it all in Full Body Muscle concentrated muscle-building, fat burning nutrition in one delicious, easy-to-make shake. Just stir a packet of Body Muscle into 10oz. of cold water or skim milk and enjoy! Incredible taste! Body Muscle is the besttasting reduced-carbohydrate meal replacement powder (MRP) ever made. That’s why the American Culinary Institute awarded Body Muscle itsgold Medal Taste Award for five years in a row. ratio of macromutrients consisting of highly bio-available, time-release proteins plus a controlled amount of high-fiber complex carbohydrates and essential fatty acids, to support lean musclegrowth, strength, and higher energy all day long! 40g of Body Muscle Proprietary blend of fast-release and slow-release proteins, togive you a sustained flow of vital amino acids (See Amino Acid profile on side panel. 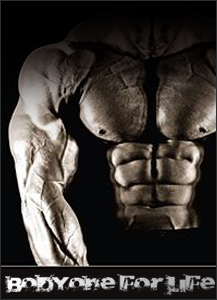 )Amino acids support intracellular nnitrogen retentiono levels for faster musclegrowth and strength increases. Acid Studies show that supplementalglutamine can also prevent muscle breakdown. 12grams of an advanced blend of low-glycemic, high-fiber carbohydrates to help stabilize your blood sugar and insulin levels, and promotegreater energy and fat burning. 4grams of Body Muscle dietary fiber per serving, providing over 30% of the RDA for fiber to support superior intestinal health and cardiovascular health. 4.5grams Body Muscle containing natural source omega-3 and -6 fatty acids, medium chain triglycerides, flax seed oil and borage oil.